Man City faced Chelsea for the Community Shield at Wembley on Sunday, and it took just 13 minutes for Sergio Aguero to get on the scoresheet. Both sides enjoyed spells of possession in the early stages, but it was City who looked the more dangerous in the final third as they looked to break the deadlock. 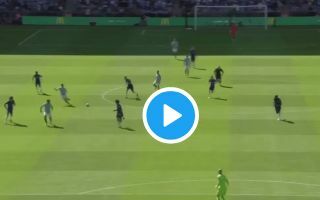 After some brilliant and intricate passing to get out of defence and into the final third, youngster Phil Foden found himself in space on the edge of the box and he kept his composure to shift the ball into Aguero’s path. The Argentine international did the rest as he was given far too much space on the edge of the box by the Chelsea defenders and lashed home a top finish to leave Willy Caballero with no chance. It was a landmark effort from Aguero, as he bagged his 200th goal for City and it came at a great time to get them off and running this season in their bid to land the first piece of silverware on offer. Meanwhile, Foden will undoubtedly receive plenty of credit for his role in the build-up. Sergio Aguero is up and running for the new season ?